– now on the run. 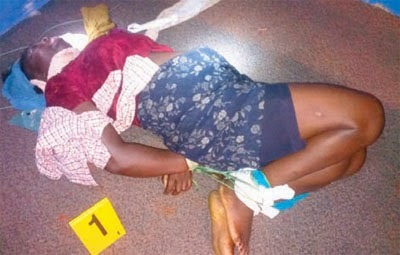 Grace Poku’s lifeless body was found with a towel filled with powdered pepper tied tightly around her face with her hands and legs also tied with a rope as she lay in a locked room. 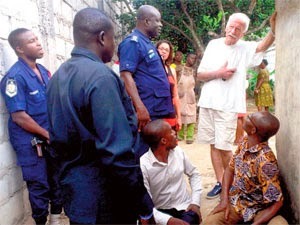 The three Nigerians – names not available at press time – who lived in a semi-detached room owned by the white man and his wife, were accused by people at the crime scene of killing Grace. These same Nigerians were reported to have attacked the wife of the white man whose name was given as Ama Kyere, 70, after which they sped off in a waiting taxi. What might have motivated the Nigerians to take this weird action was not immediately known. The room in which Grace’s body lay had been locked with padlocks and so the police at Ridge had to forcibly break into it. Personnel of the Regional Police CID were also seen busily taking vital information to help in their investigations. Snippets of information gathered indicated that Madam Ama Kyere, with blood oozing out of her mouth, proceeded to the Ridge Police Station around 4:00 pm to report that three Nigerians in her house had attacked her violently. The police quickly followed the woman to her house but the Nigerians, who reportedly did not steal anything from the house, were nowhere to be found. The old lady then alerted the police that one Grace Poku, her house help, was missing and so the police started searching for her. They then broke into the room in which the Nigerians were lodging, only to find Grace’s hand and leg tied with a rope, with her face covered with a pepper-soaked towel. The police, after talking to the people at the scene, took away the body to the morgue for autopsy. DCOP Kofi Boakye, Ashanti Regional Police Commander, said police had started investigation into the crime. He added that his outfit would find out whether the woman was sexually assaulted before she was killed by her assailants. DCP Boakye stated that the police would get to the bottom of the case soon, noting that Grace’s killers would definitely be nabbed. He therefore urged the residents not to panic.